Open the shiny steel case of a conventional HDD and you will find a nostalgic array of parts that strongly resemble a vinyl record turntable. There are stacked platters of rigid substrate coated with magnetic particles; the magnetic state of each tiny spot on these disks determines whether it is recognized as a 1 or 0 for data processing purposes. There is also an armature that moves back and forth across the disk, and at its tip is a sensor called a read-write head, analogous to the needle in a phonograph’s armature. There is an armature for each stacked disk, giving the overall armature the appearance of a comb. The phonograph’s needle reads the tiny back-and-forth jiggles of a groove cut into a vinyl record to reproduce the sounds that made groove. As it flies over the surface of the spinning disk, the HDD’s read-write head can both read the magnetic state of spots on the disk and change that state to write data to them. Spinning vinyl records topped out at 78 rpm. The disks in a HDD spin at 5,400 to 7,200 rpm typically; some high-performance HDDs may reach 10,000 rpm. This rotation speed largely determines how fast data can be read and written on the HDD. 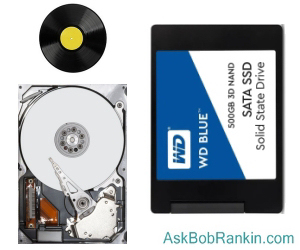 How much data can be stored on a standard-sized HDD is called its “data density” and is largely a function of the read-write head’s precision plus the speed at which the disk spins. Electric motors drive all the moving parts of a HDD. The bearings in those motors are the HDD’s Achilles heel, the typical point of failure. When your HDD starts making rumbling noises it’s a sign that its bearings are starting to wear out; when the sound changes to “grinding” disaster is imminent and you had better have a current backup of your data. By contrast a solid-state drive (SSD) contains no moving parts. Instead, it is filled with flash memory, the same stuff found in USB flash drives. Think of flash memory as a densely-woven 3-D fabric of crisscrossing wires. At the junction of two wires, electrical current can change the state of a tiny donut-shaped bit of metal; these metal donuts (also called gates) are arranged in a 3-D array. The electrical state of a gate determines whether it is counted as a 1 or 0. (Each gate can have other states as well, which increases potential data density.) The state of a gate is retained even when electricity is turned off. If you're worried about your hard drive failing, you should be making regular backups. I recommend weekly image and nightly incremental backups to an external hard drive. See my ebook Everything You Need to Know About Backups to learn why I keep *multiple* redundant backups, and how to implement a backup strategy of your own. Electrons move at nearly the speed of light, so flipping a gate’s state is nearly instantaneous. So is reading the state of any gate given its x-y-z coordinates in the array. So an SSD is silent and supremely fast. The silence is a blessing and a drawback; there is no early-warning rumbling to let you know your SSD will soon fail. On the other hand, an SSD is nearly immune to damage by dropping or jostling, whereas such shocks can knock the read-write head of an HDD into a magnetic disk to scratch and destroy it. An SSD does not suffer mechanical wear due to friction, so it should last much longer than an HDD. A Windows 10 PC with an HDD may take tens of seconds to boot up. The same machine equipped with an SSD will boot in the blink of an eye. Additionally, applications that read and write large quantities of data on mass storage work much faster with an SSD than with an HDD. Such applications include gaming, video editing, working with large databases or spreadsheets, and more. But every app that uses mass storage benefits from an SSD. That time saving alone is enough to justify the extra cost of an SSD in many people’s minds. SSDs come in the same form factors as HDDs, including standard SATA interfaces, so they can be plug-and-play replacements for HDDs. SSDs come in other form factors too: SD cards, memory sticks, and more. Solid state memory is a versatile medium. Price per gigabyte is one way to measure the value of mass storage, the HDD still reigns supreme. Back in 1981 when the IBM PC debuted, HDD prices were in the range of $300,000 per gigabyte. In 1995, when the Web was young, prices had dropped to $750 per gigabyte. Today, you can buy HDD storage for about three cents per gig. By contrast, SSDs cost about 10 times more per gigabyte. Gartner Research predicts HDD storage will cost as little as $0.001 (one-tenth of a cent!) per gigabyte in 2021. Will SSD prices continue to drop at the same rate? Time will tell. Capacities of HDD and SSD drives will continue to grow as greater data density becomes feasible. I can’t imagine needing 15 TB of storage but those who do will be able to get it in SSD or HDD, according to Gartner. SSD drives do wear out. There is a limit to the number of times the state of one of those “donuts” can be flipped before it simply stops working. Circuitry within an SSD keeps track of the number of times every donut has been flipped, and retires those that are too near their expected life’s end. Over time, less space is available on an SSD due to these retirements. But in practical terms, your computer will probably be obsolete before that happens. HDDs will always have a place in data processing, the place where low cost per gigabyte is most important. When it comes to performance, shock-resistance, and overall longevity, the future seems to belong to SSD. When I bought a my Dell Optiplex computer about two years ago, I ordered a 250GB SSD drive to replace the 500GB hard drive that shipped with it. The Samsung 850 EVO came with software called Samsung Data Migration, which made it super-easy to transfer everything from my existing hard drive, and make the new SSD my primary C: drive. The result was pretty dramatic. Startup time was slashed, programs open quicker, and everything just works faster. At current prices and capacities, I would recommend a solid-state drive as an excellent investment for any PC or Mac owner. Have you moved from HDD to SDD in your computer? Most recent comments on "[SSD] Time to Upgrade Your Hard Drive?" Why do computers of $750 or more come with SSD's of only 250GB's? If you are spending money for a better computer, why do they not offer an SSD of 500GB's or 1TB? Prices of SSD's have come down. A couple of hundred dollars for more storage seems to be money well spent. @NightwishFan What you read is somewhat true. When SSDs fail, they usually fail completely without warning and with no hope for data recovery. However, they are more durable than HDDs and are less likely to fail. It doesn't really matter, though, since all drives, SSD or HDD, are subject to sudden, irrecoverable failure. That's why backups are essential! If your data is backed up, you won't lose it to drive failure, theft, fire, malware, etc. @jim green The answer to your question is what you need RAID for. If it's to protect against data loss sue to drive failure and/or to allow a computer to keep running when a drive fails, then you will need to run SSDs in a RAID. If you are using a RAID for your sole backup, your data is still in danger. RAID is NOT a backup! Drive failure is not the only cause for data loss. Fire, theft, flood, malware, etc. can also cause data loss. The only way to reasonably protect data from loss is to have backups. Even a RAID needs to be backed up. On behalf of Jeannie (without regards to her wants, needs, or even opinion), I'll apologize on her behalf. By her post, she's obviously not of sufficient life experience to possess the knowledge that when originally described, SSD drives were described exactly as you did. While today's descriptions don't 'splain it like that, when electricity is applied to a solid-state device, the electrical charge changes the magnetic state of the material to reflect the digital 1, 0, (or other) state. I do applaud her though for having the financial wherewithal to support her ability afford to be able to ride the bleeding edge of SSD storage prices. As for fathoming the need for a 15TB storage device...she identified herself as a bit strange for her large storage (percieved) needs. In the end,....Bob, keep up the good work and thanks for the work you do. @Kevin H All consumer SSDs work equally well for read and write operations. In 2015 when the HDD on my Toshiba laptop died, Samsung had just come out with their 1Tb SSD 850EVO. I replaced the 750Gb HDD with the SSD, and have never regretted it. I divided it into two partitions, C for programs and D for Data. Users, etc. Not only is it fast, but have never lost any data.I use Dropbox and Acronis back up attached to a Seagate 5Tb external HDD with daily differential, plus weekly and monthly full backup profiles. @Richard C I do not appreciate anyone apologizing on my behalf whether I'm right or wrong. In this case I am right. Data is stored in the cells of by an electrical charge. Whether a cell has 1s or 0s is determined by the presence of or lack of an electrical charge, not a magnetic field. Searching for "How an SSD Stores Data will bring up numerous references that support what I said and nothing about a magnetic field. Like Bill I replaced the HDD in my Toshiba Laptop with an SSD. Mine came from Crucial.com with complete instructions and a link to download the software to transfer the data. I only needed to obtain a cord to connect the new drive to an USB port to do the transfer. I did the change to my laptop when I needed some software for a volunteer position which is a resource hog. The transformation was amazing, a very sluggish laptop became very quick. The best thing I`ve done to my laptop. I just wish I could have done it sooner. Jeannie doesn't need anyone to apologize for her. She's correct. I spent 30 years in the semiconductor business and present flash technology has nothing to do with magnetic fields in any way. While the first "SSD" used CCD technology which I worked on at Bell Labs in the 60s and bubble memory(which is magnetic) - they never made it into significant production. The intersecting wires description with a magnetic doughnut is even older than the HDD technology we have now. I've been interested in replacing my hard drives with SSDs for a few years now. Early on, the cost was too high for me. Now that the cost has come down, other things have changed. Now I want a minimum of 1TB on any drive that I purchase. Soon the prices for drives that size will be in my price range. But my main reason for not upgrading yet is reliability. On one hand, I read articles about how SSDs "should" last a very long time. But whenever I look at the reviews of SSDs on websites where they are sold, I am finding too many reports of SSDs that are dead on arrival. And sometimes even the replacement SSD is DOA. Many other users report failures of these SSDs within the first month or first year. Even the 'best' ones. So rather than taking a chance on purchasing a 'lemon,' I'm waiting a few years until the price comes down more, and real-world reliability improves. Until then, my trusty Western Digital hard drives just keep on performing, albeit somewhat slower. @JJ Of the 32 SSDs I've bought over the years, only one was DOA (which the vendor quickly replaced) and only one died (the very first one I bought and that was after almost five years of 24/7 usage). All but six 500GB Samsung EVOs I outgrew and the one 840 Pro that died are still in service. Keep in mind that a higher percentage of reviews are from consumers who had problems with a product or service than from ones who are satisfied. Just make sure you buy reputable brands (don't go for the El Cheapos; you get what you pay for) from vendors with reasonable return and replace policies. The vendor I use (Newegg) allows return and replacement for up to 30 days (and has been known to extend that period up to 90 days during the year end holiday sales). After that, the manufacturer's warranty kicks in. I have ran a Samsung 850 EVO 500 GB since July 2015. It has made my Dell XPS 8700 (I7-Win 10) sing compared to the new 1TB platter that came with it. I recently upgraded a 2013 Dell Latitude I3 (Win 8) to a Crucial 500GB and added 8GB of RAM. WOW. The old LT cold boots or reboots in less than 50 seconds. Large spreadsheets and power points are without discernible latency. Both the Samsung software and Crucial's version of Acronis made migration almost effortless. I did have to buy an inexpensive jumper cable for the disk cloning. I will never buy a machine without an SSD again. Regarding the drop in prices for HDDs, I was shopping at Costco the other day, and in the computer area, they were selling a Seagate 8TB back-up drive for about $165.00! I purchased my 2TB unit at Costco about 18 months ago for just under $100.00, and probably haven't filled up even a quarter of the capacity, yet. In another 18 months to two years hence, then, might we expect to see a 12 to 15TB HDD back-up drive in the $150.00 price range? That would be outrageous! With just an 8TB unit, many of us might be dead before it was filled to the brim. How many thousands of 4K HD Blu-ray movies could one expect to store on a 15TB HDD? And, maybe more importantly, how long would it take to do a defrag a 15TB unit that was nearly filled up with hundreds of thousands of photos, music and downloaded YouTube animal and stupid tricks videos? It boggles the mind! LOL! Great article, Bob. I haven't purchased any SSD, yet. For now, the HDD is perfect for my needs and pocketbook. What does make me very, very happy is the HDDs are a LOT cheaper these days!!! I had to get a new HDD, as the one that was in my desktop died. Oh, I can't complain about that dead HDD, since it lasted for 10 years and 3 months!!! Now, THAT was an excellent HDD. So, I got a WD 2TB for $80. I thought, woo hoo when I saw the price. I paid $150 for an 8.43GB HDD back in 1998 and thought I got a great bargain for that HDD!!! That first computer was the start of my being a self-taught computer "geek" and I am so glad that I bought that one, in particular. It was problematic right from the first, due to the IBM Mwave Sound/Modem card!!! So I learned how to take care of it and what I needed to do to improve it. My dear friend, Norm, taught me a lot as well. In fact, it was Norm who got me signed up with the then "The Internet Tourbus" with Bob. How about this. Put computer into sleep mode at shutdown. Go about your business. And, for the fastest "boot" just hit the space bar, etc. What's with all this nonsense about fast boot times? Where's everybody going? So, it boots in 10 seconds rather than 30 seconds, but again, what's the rush? Where are you going? Stop, and smell the roses!!!!!! Re: "Electrons move at nearly the speed of light,..."
Actually, signals, not electrons, move at nearly the speed of light. If electrons moved down a copper wire at nearly the speed of light, the wire would explode. It would be helpful to have an article about SSDs with faster interfaces than SATA. It seems that SATA SSDs are almost old hat by now (I'm not boasting here ; I still have mechanical disks -- looking to switch to SSD soon). Converted all of my machines to ssd a number of years ago - even my very old work horse XP clunkers. They all use only Samsung ssds and the Samsung data migration software is simple enough for an old empty helmet like me to use! Excellent description of how "Core Memory" worked when it was the dominant form of computer memory back in the 1950's. It surprises me that this article has not been corrected on how SSD memory works in the few weeks since it was published.